Stand up paddle boarding can open doors to many healthy and fun ways of enjoying the water. An all-around stand up paddle board can be used for fishing, running rivers, yoga, racing, touring, SUP surfing or just enjoying the outdoors while paddling around. 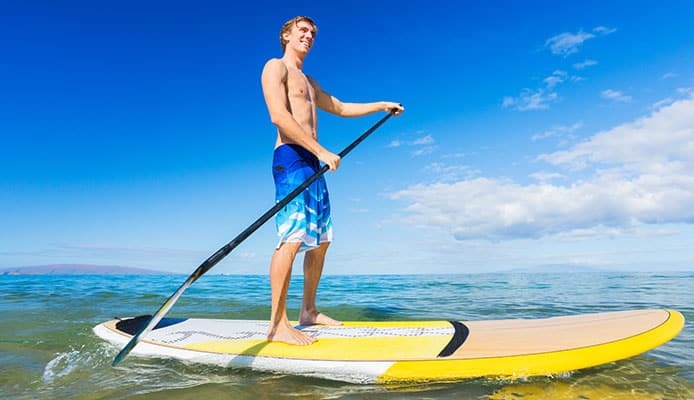 The variety of activities you can do on an all-around SUP board is usually reflected in the various sizes and shapes of boards designed for different purposes. A board designed for running river rapids will be wider than usual, for river waves or surfing ocean will be shorter than average while for racing or touring will be extra-long. Keep reading if this resonates with you. We’ve reviewed 10 paddle boards from yoga to surfing SUPs to help you choose the best all-around paddle board. Here are our favourite paddle boards and why we picked them. 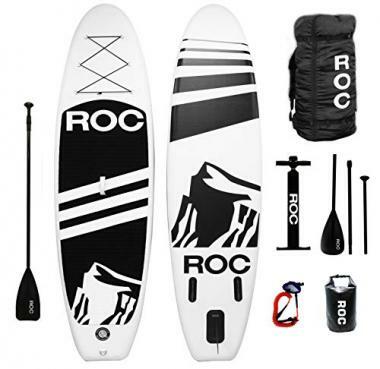 Roc inflatable paddle board is the most lightweight board and our top rated all-around SUP. This SUP is durable since it’s built with the highest quality military-grade material. It suits all skill levels hence ideal for both beginner and experienced riders. 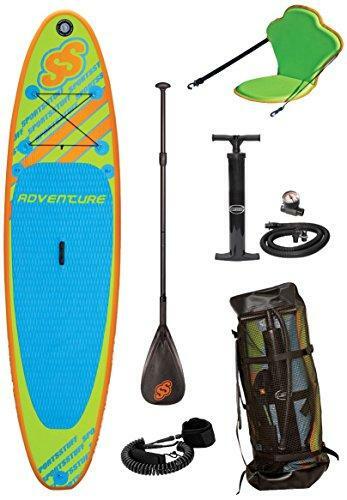 This all purpose SUP board can be used in fresh water lakes, ocean and rivers and comes with everything you need to enjoy your day on the water. Features include an alloy paddle that floats, board, waterproof cell, a leash, key bag, backpack and pump. It also has a non-slip deck and a one year warranty. SereneLife premium inflatable paddle board is extra wide for stabilizing and balancing on top of your SUP board. The top deck for this all purpose paddle board is anti-slip, stable and soft. This inflatable stand up paddle board is perfect for beginners and has been upgraded with a no-slip soft top to cushion you from falling whenever accidents or slips occur. Steering and handling this all-around stand up paddle board is easy because it’s fitted with triple bottom panel fins that provide the best paddling maneuverability. It’s also portable hence travel-friendly and preferred by those riders that have a knack for water sports adventure. You can keep it in your vehicle during those times when you just want to explore or take it with you on surfing trips. This SUP offers exceptional surf control and has an all-in-1 blow up paddle board kit and must-have paddle board accessories. 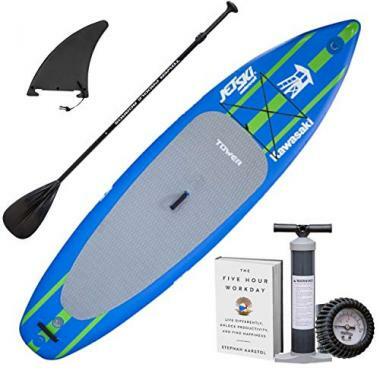 Features include 10 inch board, upgraded aluminium paddle, storage bag and manual air pump. 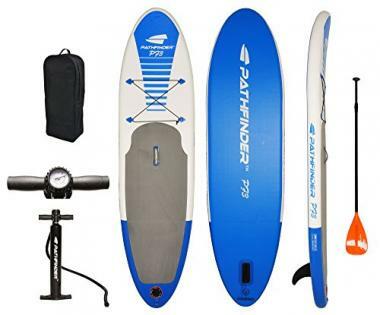 Pathfinder inflatable paddle board is portable and easy to store. It’s ideal for a wide range of water conditions. This all purpose SUP board is built with strong multi-layer drop stitch and PVC material hence durable. 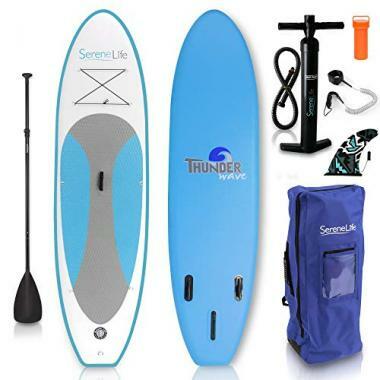 It comes with a complete kit that includes detachable center fin, SUP board bags with shoulder straps, inflate paddleboard pump, valve wrench and adjustable aluminium paddle. It also has bungee for securing on-board cargo, D-ring to attach a leash and large deck pad. SereneLife inflatable paddle board has a wide stance for improved balance and stability while standing. This all purpose paddle board is portable and perfect for the ocean, river, or lake because it deflates or inflates quickly for easy storage. It has superior maneuverability due to triple bottom panel fins that help handling and steering for easier use and improved overall speed. This stand up paddle board is perfect for beginners because it’s made for early learning. The non-slip soft top deck will protect you from getting surf injuries or being involved in accidents. 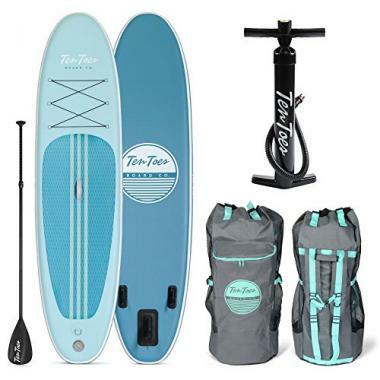 It also has a complete paddleboard kit that has oar pedal, patch repair accessory kit, surf control, manual air pump, storage bag, coiled ankle cuff safety and paddle board leash. 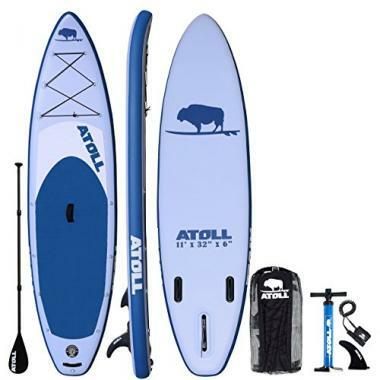 Atoll 11' inflatable paddle board comes with high pressure bravo dual action hand pump that inflates when pulling up and pushing down, front and back bungee tie downs, travel backpack with waist strap and 3rd generation hand pump of up to 15 PSI. Its lighter, has a quality ISUP board that’s wrapped with a second layer of PVC material on the top and bottom to create an extra rigid board with 15 D-rings on the deck to tie down anything you need. This all purpose SUP board comes with three piece paddle with nylon blade, 3rd generation black aluminium alloy adjustable lightweight and detachable extra durable removable fin compatible with all US/universal fin boxes. There are no tools needed, lost screw fins and is compatible with almost all aftermarket fins. The heavy-duty backpack nylon carry bags are large enough to fit paddle board, pump and paddle. Mesh sides allow iSUP dry while being stored. It has a 2 year warranty and the tri fin design enables efficient and easier tracking. Peak 10'6" paddle board has a wide stance that ensures a sturdy and stable stand up paddleboard. This all-around stand up paddle board also has a non-slip surface. It’s perfect for all water conditions including rough water and skill levels while bungee cords secure your SUP fishing gear and water bottles. This SUP is saltwater and freshwater compatible to enable you enjoy endless summer fun with a peak inflatable SUP board for relaxing, surfing, exercise, SUP fishing or any other outdoor water sport. 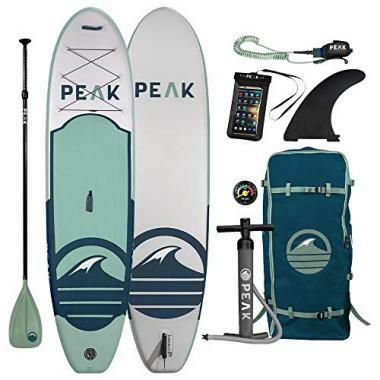 It comes with ready to surf iSUP accessory bundle that includes a paddle, high pressure pump, a peak inflatable paddle board, carry back pack, fin, waterproof phone cases and coil leash. It’s built with tough 6 inch military-grade PVC to make it durable. It has a puncture resistant tough outer shell to prevent damage and dings. It also has a lightweight design with nose carry handle for easy transportation, 1 year warranty on materials and 30 day guarantee. Retrospec weekender is one of the most stable inflatable stand up paddle board and ideal for riders of all skill levels. This all purpose SUP board is made of military-grade PVC hence indestructible. It can be rolled into compact package for easy transportation and storage. It comes with three pieces adjustable and lightweight aluminium paddle, manual pump, indestructible iSUP, three removable nylon fins, and a 1 year warranty. It’s longer making it perfect for enjoying yoga, touring and relaxing. Package deal includes three piece SUP paddles, pump, inflatable SUP with attached bungee rope and fin. It’s easy to transport this stand up paddleboard due to availability of handles on the tail and nose making it easier to carry when inflated. This board feels similar to a hard board when fully inflated and has a non-slip deck. You don’t have to worry about board cracks and dings because it’s built with drop-stitch and military-grade PVC material hence durable. This SUP comes with a 2-year warranty on iSUPs that cover everything outside of normal tear and wear. However, it doesn’t apply to included accessories or paddle. ISLE airtech offer incredible stability on small waves, flat water and river runs while staying lightweight. This all around SUP board is perfect for beginners and experienced riders. It has a deck mounted bungee system for carrying nose, mounted handlece and extra gear. This SUP is built with military-grade material hence durable. 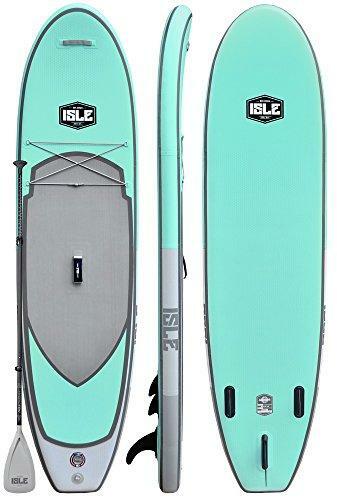 This all purpose paddle board has a carry back pack, leash fins and pump. It also has a repair kit that includes high pressure pump and gauge, removable travel fin and 3 piece aluminium adjustable travel paddle. Sportstuff adventure has large anti- skid EVA pads for secure footing. It’s lightweight and has black molded plastic blades, foam rubber grips and adjustable drip guards. 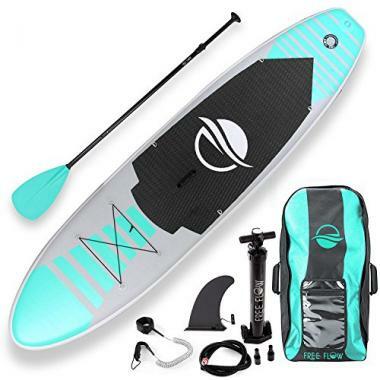 This all purpose paddle board also has a mesh backpack that includes removable seat, pressure gauge, paddle, hi pressure hand pump, board leash, fin and valve wrench. Your size will determine the type of SUP you’ll buy. If you’re short, you should go for a thinner board with a little less length to make paddling easier for you. All boards have weight limits. Most offer weight limits between 200 – 350 lbs. You should choose a different sup board if your weight is over the weight limit of a particular board. The thickness of a board will correlate with how well it will change direction in the water and how much weight it can hold. Longer paddle boards are usually faster while racing or touring around and easier to keep straight while a shorter board is great for surfing and catching the waves. SUPs have 1-5 fins and more fins mean more specialization. Boards used for lake touring may only require one fin. However, a SUP will perform better with waves if it has more fins. Every SUP comes with a traction pad that makes standing up a lot easier. These pads are no-slip to enable you balance when water spills on the pad. If you’re an experienced SUP rider, you should purchase a board that comes with some type of paddle board accessories. Nowadays, most all-around boards offer accessories to help you enjoy your board. Q: What Does “All-Round” Stand For? A: All-round means a paddle board that’s versatile with many uses and good at a wide range of things. Q: What Are The Main Advantages Of An All-Round Paddle Board? It can be done anywhere including oceans and lakes making it popular for riders who live inland. They can ride on a local river instead of driving to the shore. It’s an excellent workout that will strengthen your core muscles as you move your paddle especially the inter-vertebral and obliques muscles. It will help you lose weight since it can burn 400 or more calories in an hour help reduce strain on knees and lower backs. The wobbling of the board will help you improve balance because of working constantly to keep your body upright. SUP will train all your muscles to work together including your smaller muscles that are usually missed during a gym session while push-ups will work on your large muscles. Q: How To Care For My Paddle Board? A: If you want your all-around stand up paddle board to last, you need to care for it. Follow these maintenance tips to make your SUP durable. Store your stand up paddleboard out of direct heat because they aren’t designed to be left out in direct sunlight for long periods. You risk de-lamination. This is when the fibreglass bubbles up and separates from the rest of the board. Buy a SUP cover if you’re travelling to prevent stone chips. Also stay clear of coloured boards because they attract heat subjecting your board to higher temperatures. If you’re taking your all-around SUP board in the surf, wear a legrope to prevent a collision especially if you’re surfing near big crowds or rocks. Repair your SUP immediately if it’s damaged to avoid water seeping into the core of your board. Use a SUP paddle guard to protect the paddle and rails from knocks and pumps without affecting your paddle’s performance. Invest in waterproof rail tape, its durable and easy to apply. It will protect your rails from scratches and chips. Rinse and dry your SUP board after use. If you’re in salt water, wash off all the salt to keep your SUP board looking great. Don’t put your paddleboard inside the cover when it’s still wet to avoid osmosis (when water is absorbed back into the board’s finish causing the paint to bubble). When you’re looking for an all-around stand up paddle board to buy, you should go for a SUP that will handle different water conditions and activities. The boards we’ve reviewed above fit that criteria. We hope you’ll use our reviews to find the best SUP for yourself.